The sea is the graveyard of the Chateau D’If! I have been reading The Count of Monte Cristo, and I do not have time to spend coming up with clever concepts or anything, but rest assured: this depicts a moment of freedom. In three hours I will be on the first leg of a trip to Sicily. I’m not sleeping tonight. Will doing that help with jet lag? God knows it’s been long enough since I’ve had to deal with that – I don’t remember. We shall see! But I could not just skip Illustration Friday, you understand. Outstanding! Beautiful colors and angles! well, if one dreamt freedom for long and got it at last, this is Montecristo. Wonderful piece of art. Excellent illustration. I could easily see it on the cover of a new edition of The Count of Monte Cristo! Wonderful! Great colors, and perspective. I love the sense of the movement of the waves. This is a very scary looking scene! 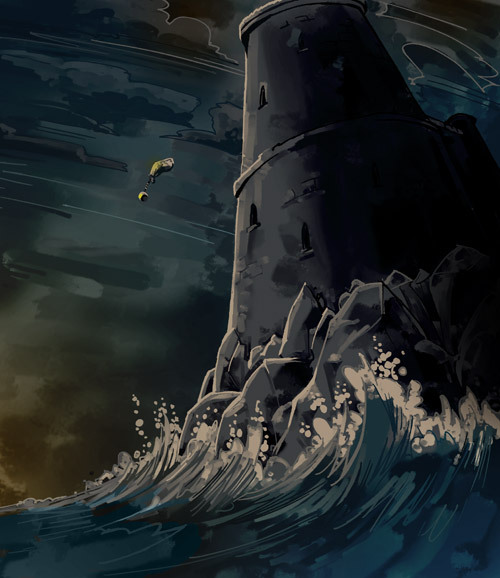 The waves and tower are so strong , and the body looks so small and insignificant. Excellent technique! I have gonna mad after reading the book’The counts of monte cristo.’I always imagine if mercedes and edmond never got seperated, how sweet but life played a big game with.I madly want to see the movie! We wanna use your awesome illustration in the chinese version of Le Comte de Monte-Cristo. Please contact us.